Anahuak Youth Sports Association, The City Project and COFEM use soccer as an organizing tool for students to move more, eat well, stay healthy, do their best in school and in life — and vote! Mountains Recreation and Conservation Authority (MRCA) sponsors Transit to Trails trips with Anahuak and The City Project. Diverse allies organized Copa COFEM at Rio de Los Angeles State Park at Taylor Yard October 29-30. The youth soccer tournament promotes fun, physical activity and healthy eating, and and good citizenship. Civic leaders including Raul Macias and Councilman Ed Reyes urged citizens to vote. 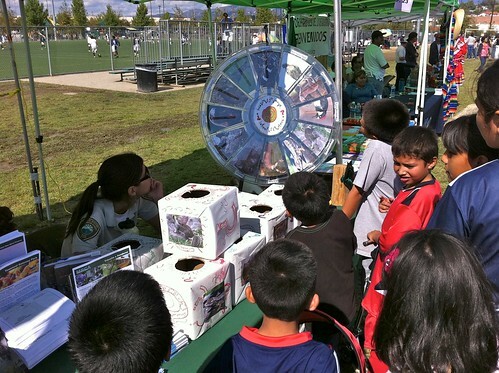 Health advocates provided educational programs about physical activi and healthy eating. The City Project engaged, educated and empowered the community to support an equity plan to Save California State Parks for All, and to prevent high speed train from destroying state parks. The benefits and burdens of public resources — including state parks and high speed train — must be distributed fairly for all.